Well then. If Popsicle Week isn't an excellent reason to come out of hiding, I don't know what is. And as the stars have aligned this year, I am actually in the Northern hemisphere popsicling in summer for the very first time. Hoorah! In celebration of such historic events, I've brought a particularly refreshing 'sicle to the party - creamy, sweet coconut and lemongrass at one end + light, icy coconut water with some pretty slices at the other. Ie. Beach babe up top, pool party Barbie down below. Can I also just say that I blame these guys for a renewed addiction to condensed milk. Also lemongrass in everything this summer please. Whisk coconut milk, condensed milk and lemongrass together. Pour into popsicle moulds, filling 2/3 only (or any ratio you desire really) then place in the freezer and wait about 40 mins to an hour before inserting sticks (so that they don't fall over, smartie pants). When frozen solid top up last 1/3 with coconut water and a couple of slices of coconut. Freeze again until solid. Hashtag popsicle week continues all week so get your butts over to Billy's place and refreshrefreshrefresh okay? Over 50 bloggers are making popsicles so you may want to go clear out your freezer. Friends, it's time for our monthly(ish) heart to heart. Not only did I get to play with my new lover, moss, for this post, but I got to mark two things off my 'wanted to do forever' list: One. Do a post for Urban Jungle Bloggers and, Two. Magically tin a plant by way of this amazing tutorial. If you haven't come across the Urban Jungle Bloggers yet, you need to. They're basically a community of bloggers led by Judith and Igor who celebrate all things green and leafy by posting to a theme each month. So this month's theme is to give a green gift. Aka the best gift in the world. Aka let's get tinning! The cliff notes plus my hack version of the aforementioned tutorial is this: Buy some beans. Turn tin upside down and use a can opener to take off bottom. Eat beans or put into a container and keep in the fridge for later consumption (DO NOT WASTE THEM!). Wash tin and remove label. Put moss in the bottom (or top) of the tin so that the green is at the bottom. Cover with compost or a good, fertile soil then water. Stick removed tin bottom back on with hot glue. I actually used a thick piece of cardboard cut to size for the bottom because it seemed slightly less dangerous than handling the sharp aluminium disk. I also kept it simple and skipped adding a new label as I prefer it nice and naked for display purposes. Finish with a little tag and make sure you gift it within a couple of days once tinned. Fun right? Towards the end of last year, Helen and I brainstormed different ways to use edible flowers (she posted about it here) and one idea that didn't make the cut was floral infused simple syrups. I have however been obsessed with it since as it really is so simple (see what I did there?) and with spring in the air over here in London it felt like time to revisit it. Simple syrups look and taste like you put a lot more time into it than you actually did which make them perfect for a last minute gift. They'll jazz up any soda or cocktail and I promise once you start syruping you won't want to stop because the flavour possibilities are endless. 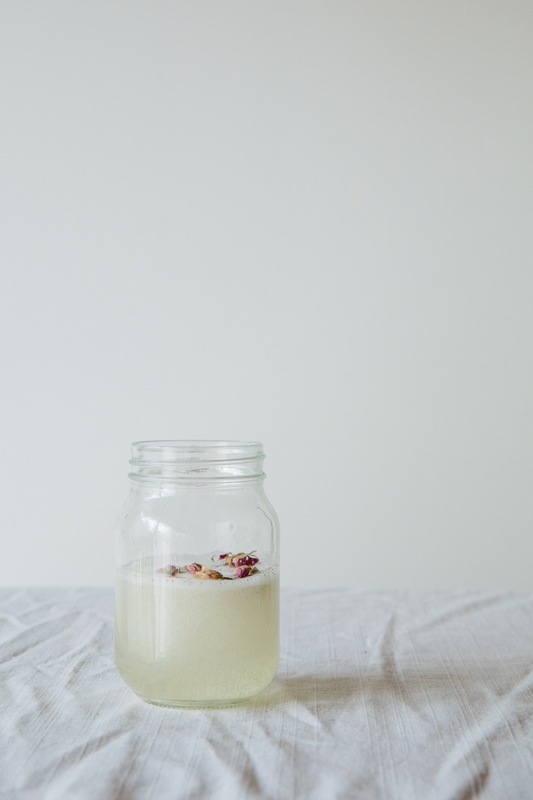 To make a simple syrup of the floral variety, put equal amounts of water and caster sugar in a jar, add a dash of dried edible flowers (such as rose, chamomile or lavender) screw on the lid, and leave for a day or two. The sugar dissolves at room temperature so when you're ready to use it, you just mix the syrup with sparkling water (and booze if you wish) for a refreshing drink. If, like me you want to have even more tastebud fun times, may I suggest adding lemon zest to your infusion? Or pink peppercorns. Do it.